Behind closed doors, the justices on the Supreme Court are considering taking gay marriage cases from five states: Utah, Oklahoma, Virginia, Indiana, and Wisconsin. The Justices put these cases at the top of their schedule. All five states had either their marriage amendment or laws over turned by the lower federal circuit courts. The justices could decide to hear all 5 cases, put them all into a single case, wait for more cases or reject them altogether and allow the lower court rulings to stand. Most legal analysts on both sides of the issue believe the Supreme Court will hear one or more of the cases and make a decision that will affect each and every state. The people in favor of gay marriage preach that June will be the end of the issue and that the court will make a ruling similar to Roe vs Wade and enforce legalized gay marriage in every state in the nation. The LGBT lobby insists this is inevitable and that everyone should just give up the fight and join the right side of history. The LGBT lobby has reasons to declare their victory so confidently. The US 7th court of appeals ruled that Indiana and Wisconsin had no “reasonable basis” for defining marriage as a union between one man and one woman. In essence the 7th circuit court declared that the only reason millions of Americans in more than 30 states voted for man/woman marriage was because they are bigoted. These judges have affirmed the idea that marriage solidifies the relationship children need with their mother and father and that marriage laws should reflect that and be left to elected officials, not judges. 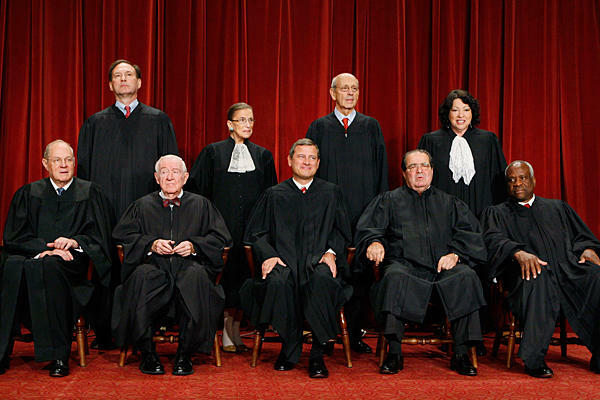 The June 2013 Supreme Court ruling left marriage laws open to the states. It may have been the inertia activist judges were looking for to declare conjugal marriage unconstitutional, but it would still be surprising if the high court undoes a ruling from only two years previous. Most people predict that the Supreme Court will once again hear arguments over gay marriage and that a ruling will be handed down by the end of June 2015.